In 1998 an area of small-scale copper smelting was found eroding out of the face of a terrace on the east side of the Great Orme, Llandudno, Conwy. This was a prehistoric site of great value for its potential relationship with the Bronze Age copper mines on the Great Orme, and was at risk from erosion. A rescue excavation was carried out by GAT in that year, however further eroding remains were identified and excavated in 2011. 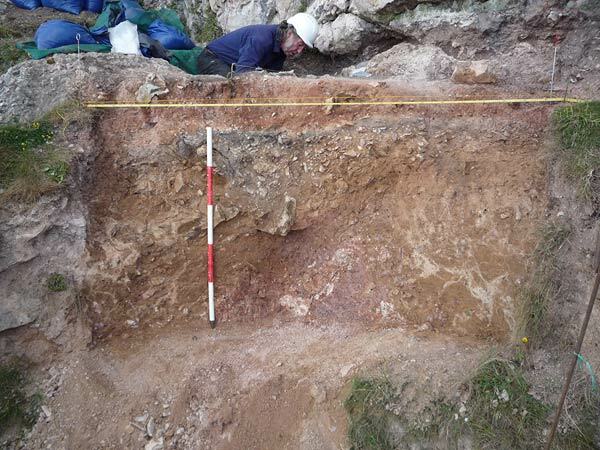 A feature that had been observed, thought to possibly be part of a smelting pit, proved to be of natural origin but further evidence of prehistoric activity was found in the form of animal bones, shells, pottery and copper smelting residues. A preliminary report has been prepared (GAT Rep. No. 1029), including assessment of the metallurgical residues. Post excavation work on the excavated material is now in progress and two radiocarbon dates have been received indicating a date for the main activity horizon in the late 2nd millennium cal BC.